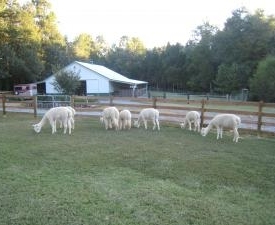 Palomino Alpaca Farm is a small farm located on 10 acres of gentle rolling pastures and wood lands nestled between country homes and manufacturing, and safely enclosed within it’s protective boundaries. An ideal area to pasture small herds of dams with their young crias without concern for predators. Our choice to specialize with white Huacaya alpaca’s, stems from mostly personal preference, however white fleece can be extremely fine and soft, easily dyed, and is highly marketable in the garment industry. These choices have culminated into a selective breeding program with the highest quality bloodlines affordable. Each breeding is matched to improve the qualities of the previous generation. Therefore genetically improving the fleece, as well as, the physical characteristics of each new generation.